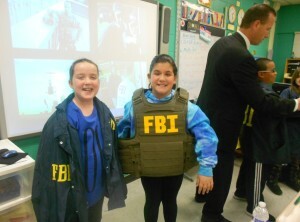 Photo above left – FBI Agents intrigued the students with their personal stories. In photo are 4th grade students Erica Fajfer and Jamie Reardon. Photo right: – New York City Fire Department firefighters Mr. Forte and Mr. Ott brought along some of the safety equipment (which protects the firemen up to 1,500 degrees Fahrenheit) they wear each day. 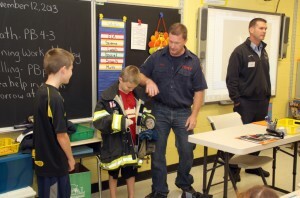 In photo, students Ryan Ott and Cody Forte try on the gear. Photo below – Before being escorted by their children or family member to speak to the students, Career Day volunteers gathered for refreshments and a photo.